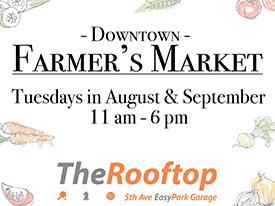 The Rooftop at EasyPark’s 5th & B parking garage will now have the addition of a farmers market on its rooftop. Duane’s Top Shelf Artisan Market will be setting up 3-6 booths that will offer local produce, grass-fed Alaska meats, along with local produced honey, zucchini relish & salsa. The market will be open every Tuesday, starting August 23rd, from 11am-6pm till the end of September. As a reminder, first hour is free at the 5th & B parking garage. For more information about The Rooftop, please call ACDA at 276-7275 or visit www.acda.net or www.easyparkalaska.com for news updates about The Rooftop.